Metered Enterprise Licensing Agreement (MELA) offers enterprises and service providers a flexible way to license their application delivery resources. MELA meets the demands for flexible application capacity and the requirements of environments such as cloud for multiple Application Delivery Controller (ADC) instances. By using this model, an organization subscribes to a defined monthly capacity that can be distributed across unlimited on-demand ADC instances deployed between multiple cloud and on-premises environments. MELA is a subscription service and enables organizations to pay-as-you-grow with an application delivery infrastructure that is flexible, cost-effective, scalable and always right-sized. Non-ASL LoadMaster can also be added to MELA KEMP 360 Central instances â€“ but they will not count towards MELA usage. 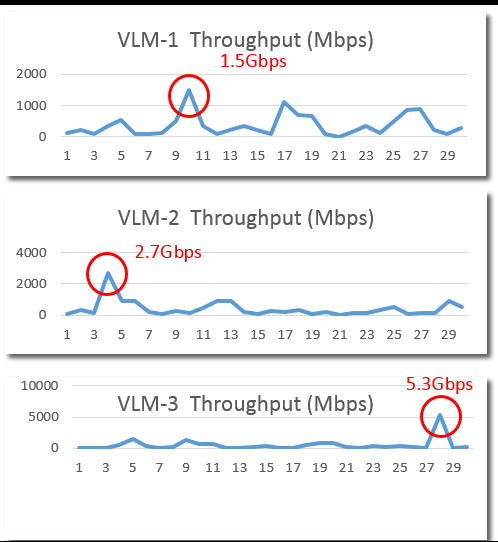 The example scenario below shows the usage for three VLMs during a one-month period. In the example scenario shown, KEMP calculates the monthly throughput as 1.5 + 2.7 + 5.3 = 9.5 (Gbps). KEMP charges monthly, in arrears, based on the MELA usage tiers. This document provides information on Metered Licensing Management in KEMP 360 Central. Anyone who is interested in finding out further information regarding Metered Licensing Management in KEMP 360 Central. This section provides a short description of KEMP 360 Central MELA, its features and benefits. The features and benefits are outlined in the table below. Use the same MELA license for all load balancing instances regardless of deployment location (for example, public cloud, private cloud, hybrid cloud). Todayâ€™s application and service delivery environments are complex and dynamic. A metered licensing approach offers the flexibility to address the challenges posed in a cost-effective and easily managed way. I need multi-tenancy so I can isolate for security and compliance Traditional multi-tenancy requires large appliances that are expensive to scale and focused on a limited number of large tenants. With Metered Licensing, individual application instances, departments, and organizations have dedicated and isolated load balancers of any capacity. I need to be able to scale on demand Hardware-based solutions do not fit well in dynamic environments because they must be over-provisioned to meet anticipated demand. In contrast, Metered Licensing is always right-sized and can instantly scale to meet unpredicted demands. I need to load balance in the Cloud Metered licensing fits perfectly with cloud consumption models because you only pay for what you use and have the flexibility to scale within a single load balancer instance or to scale using multiple instances. I need to react quickly to business demands Metered licensing simplifies the process of provisioning LoadMaster instances as services can be easily deployed, licensed and configured for service using the LoadMaster Application Programming Interface (API) and platform auto-provisioning tools. KEMP 360 Central MELA sends monthly usage reports to KEMP through alsi.kemptechnologies.com. KEMP 360 Central uses port 443 to communicate with the LoadMasters. When licensing, communication occurs both ways, however, for RESTful API and for polling, communication occurs in one direction only. In addition, the LoadMaster uses syslog to send information to KEMP 360 Central. There are two ways to provide usage reports to KEMP. Click the Settings and Configuration icon, click Metered Licensing Management then click MELA Report. Select the Upload usage report to KEMP check box and click the Upload button. Select the Send monthly usage report via email check box. To send a copy of the report, enter the receiving email address in the Send bcc to text box. You must configure the SMTP settings to send emails. For further information, refer to the KEMP 360 Central, Feature Description. There is a grace period of 90 days during which the KEMP 360 Central instance continues to work as normal even if KEMP 360 Central does not provide any usage reports. When KEMP 360 Central sends a usage report, the grace period reverts to 90 days. If KEMP 360 Central does not send any usage reports during the 90-day grace period, KEMP 360 Central stops working and all ASL LoadMasters are removed. These ASL LoadMasters must be re-added and be re-licensed to use them again. During the grace period, KEMP 360 Central displays how many days remain until the license expires. After installing the KEMP 360 Central instance, please license it. For installation instructions, please refer to the relevant Installation Guide on the KEMP Documentation page: https://www.kemptechnologies.com/documentation. A Contract ID is required. KEMP provides a Contract ID when you purchase a MELA license. A MELA KEMP ID and password are required. If you do not already have a KEMP ID, register one here: https://kemptechnologies.com/kemp-id-registration/. Contact your KEMP representative to get the KEMP ID changed to a MELA KEMP ID before licensing. 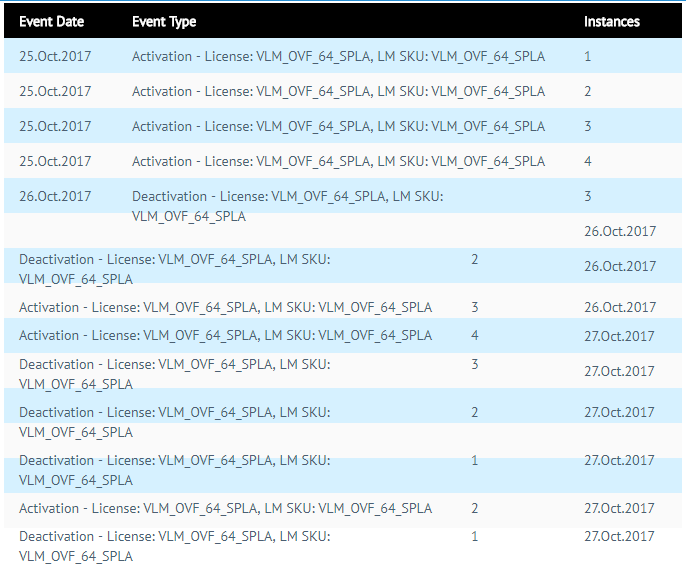 SPLA builds must be used where the LoadMaster is being deployed under a Service Provider Licensing Agreement (SPLA) or a Metered Licensing Agreement (MELA). SPLA builds only license successfully against a KEMP ID that has been explicitly enabled by KEMP for SPLA or MELA. For further information on licensing the KEMP 360 Central machine, please refer to the KEMP 360 Central Licensing, Feature Description, but remember that a Contract ID is needed instead of an Order ID. 1. In the bottom-left corner of the KEMP 360 Central User Interface (UI), click the cog icon. 2. Click Metered Licensing Management. This screen displays information and metrics data on LoadMasters licensed using the ASL functionality. There are three tabs in the Metered Licensing Management section: Activations, MELA Report, and Licenses. To view reports, click the MELA Report tab. For more information, refer to the MELA Report section of the KEMP Documentation page. For further information on ASL, refer to the KEMP 360 Central Activation Server, Feature Description. MAC Address: Each device has a unique media access control (MAC) address to identify it for communications purposes. LoadMaster Version: Firmware version installed on the LoadMaster. Status: There are two possible statuses; Active and Disabled. Activation Date: The initial activation date of the particular ASL instance. Boot Date: The initial boot date of the particular ASL instance. Last Kill Date: The date the particular ASL instance was last killed. License Type: The type of license assigned. VLM Name: The name of the hypervisor platform on which the unit is running the VLM. Peak SSL transactions per second per LoadMaster. History of ASL activations/deactivations for the past month. 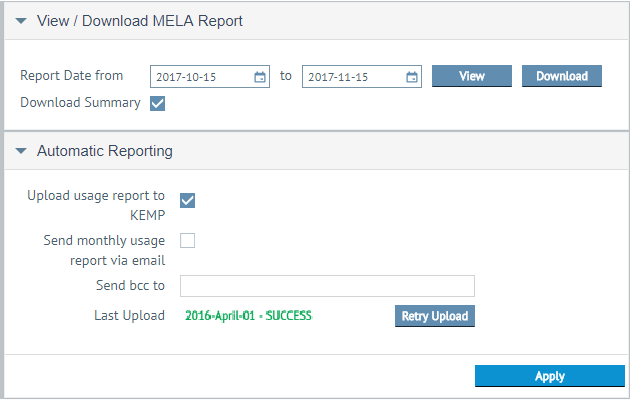 To access the MELA report section, click the Settings and Configuration icon, click Metered Licensing Management, and click MELA Report. devices: A report displaying the currently active devices on KEMP 360 Central including the ID, device nickname, and device IP address. ssl_tps: An SSL Transactions Per Second (TPS) report. vs_bytes: A report displaying the number of Virtual Service bytes transferred. If there is an upgrade, KEMP 360 Central records the number of active ASL LoadMasters (if any) at the time of the upgrade. KEMP 360 Central records this in the audit log reports (at an INFO level). KEMP 360 Central does not record this if no ASL LoadMasters are present. For the daily task, if the last known number of ASL instances does not match the current number of ASL instances, KEMP 360 Central records the discrepancy and the audit log reports (at an ERROR level) the discrepancy and the previous/current number of active instances. To view a MELA Report for a specific date range, select the date range then click View. This report provides you with a graphical representation of the information, such as the maximum number of ASL instances that were recorded during the report period, the peak number (top five devices) of SSL transactions, and the peak throughput (top five devices). The report displays usage data, which enables you to examine and validate the periodic billing statements you receive from KEMP for metered licensing. If you select the Upload usage report to KEMP checkbox, a report is also sent to KEMP with the same data but different time profiles. If the automatic reporting fails, you can click Retry Upload. These reports provide you with a graphical representation of the information such as the maximum number of ASL instances that occurred during the report period, the maximum number of SSL transactions and the maximum throughput for each individual day. This enables you to monitor usage and determine how much you will be charged. There is also a table under the graph that displays the information in tabular format. You can also view detailed individual graphs on the peak SSL TPS of the top five devices. In addition, you can view the peak throughput per device and see the aggregate used over the time period. You can print the file in PDF format if required. KEMP 360 Central compiles monthly reports on data usage and KEMP use this data for billing purposes. KEMP 360 Central currently reports on traffic, SSL TPS and Virtual Service bytes transferred for all ASL LoadMasters. Upload usage report to KEMP check box (on by default) and the system automatically sends the report to KEMP at the end of the month. Select the Send monthly usage report via email check box to try and send the report by email. To send a copy of the report, enter the receiving email address in the Send bcc to text box. You must configure the SMTP settings to send emails. For further information, please refer to the KEMP 360 Central, Feature Description. Note that MELA reports can be large, in excess of 10MB on a fully loaded KEMP 360 central system. Your email provider may reject emails that are larger than a certain size. If you exceed that limit, your email may be silently lost. In both cases, KEMP 360 Central MELA provides the information through port 443 to alsi.kemptechnologies.com using an outbound connection from KEMP 360 Central MELA in your network to KEMP Technologies. 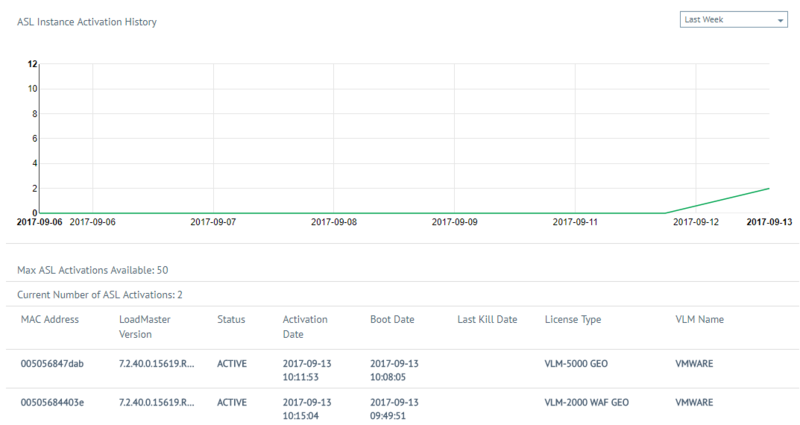 A summary of license details for all the LoadMasters in All Networks or a specific network can be displayed by clicking Network and Device Administration, selecting the appropriate network node in the network hierarchy, clicking System Configuration, and opening the Licenses section. You can display the Licenses section for all networks by clicking Network and Device Administration > System Configuration. You can also display the License section for all networks by clicking the Global Dashboard icon then clicking View List on the Non-Local Licenses & Subscriptions widget. By default, the licenses are sorted by IP address in ascending order. You can change the order of displayed results by clicking the arrows next to the IP Address column and the Expiration Date column. In the License or Subscription column the license type is displayed first and any subscription-based licenses will be indented below this. A Classic license refers to a non-subscription-based (or legacy) license. If you add a LoadMaster, it should appear in the Licenses table without having to refresh the page. If you do not see it, you may need to check the credentials specified for the device on KEMP 360 Central. Similarly, if you delete a LoadMaster, it will be removed from the list. Any LoadMasters that have passed their expiration date will appear in red in the Expiration Date column. The Licenses table does not list any devices that are down or otherwise unreachable. For LoadMaster HA Pairs, there is no licensing information displayed for the HA Shared IP Address â€˜deviceâ€™. This is because the HA Shared IP does not belong to one particular device, but instead is passed between the two HA units. To see the licensing information for a LoadMaster HA Pair, you must look at the licensing information for the individual HA units in the pair. When a LoadMaster activates a license from your KEMP 360 Central instance, a special icon appears in the network tree. This icon means that the device is licensed and the credentials for the device must be added so that KEMP 360 Central can communicate with the device and manage it. It is therefore essential that credentials are added as soon as possible after license activation, or you essentially have an unmanaged device consuming a license. Since Version 1.13, KEMP 360 Central automatically removes an ASL-activated LoadMaster for which credentials have never been provided on a regular schedule, defined in Settings and Configuration > ASL Settings (3 days is the default setting). When such a device is deleted, its license is deactivated and returned to the unused license pool, and that IP address is blocked from taking a license again. The reason 3 days is used as the default is to take weekends into account. For example, if a license is taken on Friday, there may be a time delay before the owner receives a request for a license. To change the time period to be shorter or longer, click the Settings and Configuration icon and use the drop drown arrow in ASL Settings to select the time you want to block the activation after. The available time ranges are 1 hour, 8 hours, 1 day, 2 days, 3 days, and 7 days. As an administrator, you are notified of any blacklisted devices by email, if SMTP settings are configured. These devices are also listed on the Settings and Configuration > Metered Licensing Management page with the keyword BLOCKED. The system log is also updated. 1. Click Settings and Configuration > Metered Licensing Management. 2. Locate the LoadMaster you want to unblock in the table by looking for the BLOCKED keyword in the Status column. 3. Select the check box in the Unblock column for that LoadMaster. 5. Re-activate the LoadMaster against KEMP 360 Central to add it back to your network tree. To do so, open the LoadMaster WUI and click System Configuration > System Administration > Update License. 6. Re-license the LoadMaster to add it back to your network. Unless otherwise specified, refer to the following documents at http://kemptechnologies.com/documentation. This document was last updated on 20 April 2018.